Over the last couple of weeks the cabbages have been huge and with only me to feed they’ve been a struggle to get through. So I took last Saturday’s cabbage round to my neighbour. As it turns out, my neighbour is not a great fan of cabbage, so she passed it on to her parents. The cabbage was too big for her parents so they donated it to a day centre for the elderly. 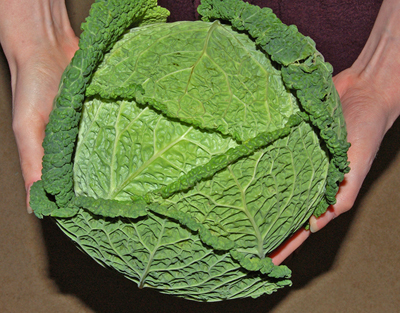 When my neighbour told me the story of the cabbage, which I am dubbing The Great Cabbage Trail, I had to laugh. I understand that in the end my giant cabbage fed about a dozen people who said it was better than the veg they normally eat. So, a big ‘Yay’ for the monster cabbage, it’s nice to know it’s done some good. Looking for the cabbage soup diet? Go here. There’s a bit of a little ‘n large scenario with the veg box this week. The huge cabbage has come straight from the Land of the Giants, while the teeny fennel was surely grown by The Borrowers. Whilst the fridge is being taken over by cabbages, the cupboard is overrun with onions, so it looks like it will be a week of cabbage soup! 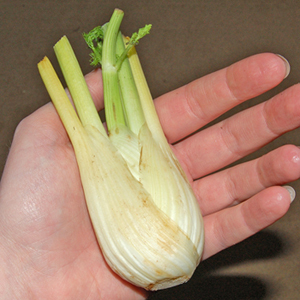 I wonder what cabbage soup tastes like with a hint of fennel? Sounds like it should work . . . I’ll let you know. UPDATE: Yes, that works! In true Vegging Out style, the soup was thrown together from what I had around. I used half a cabbage from the Land of the Giants, the fennel and three onions from The Borrowers, a handful of frozen peas, two cloves of garlic, one pint of veg stock, some vegetable oil (just enough to start cooking the onions), salt and parmesan. I don’t normally use salt, but it does bring the flavour out. The fennel was very subtle you could hardly taste it, but I think it was a good mix. Fresh, homemade cabbage soup is surprisingly tasty. Having come to this conclusion I decide to find out what is involved in the fashionable cabbage soup diet and discover what the fuss is all about . . . I enjoyed my cabbage soup last week so I thought I’d make another. I saved a few cabbage leaves to use later in the week and shredded the rest for the soup. From my veg box I also used two small onions and some garlic. Routing around the fridge I find the remains of a pot of ricotta and my box of bean sprouts, and sprinkle both on top. Whilst I do like my cabbage soup, I don’t think I could stomach the Cabbage Soup Diet – I think you can only have so much – but I’ve always wondered what it entailed. So . . . Looking at various postings on the internet, I’ve pieced together a general consensus on this cabbage diet, which is said to help you lose 10–15 pounds in one week (can it really?). The basis of this diet is obviously cabbage soup, of which you need to eat two bowls a day (clearly without the added salt and cheese). As well as this you also eat the foods below. Day 1 – Unlimited fruit except bananas. Day 2 – Jacket potato with butter and unlimited veg, except sweetcorn, beans and peas. Day 3 – Your choice of fruit and veg, with the above exceptions. Day 4 – Up to 8 bananas and 2 glasses of skimmed milk. Day 5 – 10–20 ounces of beef, chicken or fish, 6 tomatoes and at least 6 glasses of water. Day 6 – 10–20 ounces of beef, chicken or fish and unlimited veg. Day 7 – 2 cups of brown rice, fruit juice and unlimited veg. For drinks you can choose from water, cranberry juice, unsweetened fruit and herbal teas, and black coffee. But . . . because this diet is so low in protein and complex carbohydrates it is designed to be followed for one week only. I don’t think I’ll be following it. That’s 14 bowls of cabbage soup in one week! One or two bowls a week is enough for me. If you have tried the cabbage diet, I’d love to know how you got on. Find some yummy cabbage soup recipe ideas. One of the things about getting a veg box is that you get the veg just as nature intended. It hasn’t been chopped into a precise shape or squeezed into plastic with all the air sucked out. We’re so used to seeing our veg packaged and looking ‘perfect’ on a supermarket shelf that when we see it in its natural state it almost looks weird. All furled out and supremely healthy, my cabbage stretched across the entire box. I want to make the most of this lovely fresh cabbage so half of it will be used as the green part of a few meals and the other half will go in a soup. Most of the soups I’ve made pretty much follow the same recipe: fry a chopped onion in butter until soft/golden, add the rest of the chopped vegetables (in this case half a cabbage) and steam/fry for about 5 minutes. Then add the stock (I use about a pint of stock made with a couple of teaspoons of swiss vegetable bouillon, which gives you two generous bowl fulls), season and simmer for about 20 minutes. I add garlic to my soup before I whizz it up with a hand blender. When the soup is ready to be served I add a little sea salt, which really brings out the flavour, and scatter the top with grated cheese. Now, I know that the words ‘cabbage’ and ‘soup’ probably don’t have you salivating, but this is one tasty soup! With the added cheese it is really filling so you don’t always need to eat it with bread. Spring Vegetable Soup with leeks, peas, parsley and cheddar. Transylvanian Tomato-Cabbage Soup with tomato and oregano. French Cabbage Soup with carrot, sausage and thyme. Hearty Cabbage Soup with celery, potato and sour cream. Caraway Cabbage Soup with tomato, dill, egg and caraway seeds. Bacon and Cabbage Soup with bacon, potato and bay leaves. The Famous Cabbage Soup with carrot, pepper, tomato, celery and rice. What Nutrients are in Cabbage? Cabbages are extremely nutritious. Their nutrients include: vitamins A, B1, B2, B6, C and K, calcium, magnesium, manganese and potassium. Cabbages are also an important source of fibre and phytochemicals reported to inhibit the growth of cancer. With all this goodness, cabbage soup can give you a great vitamin boost. Find out about the cabbage soup diet.